Letters were sent in plain white envelopes to at least six communities in England, including East London and other regions with a large Muslim population. How Musharraf became a Billionaire? 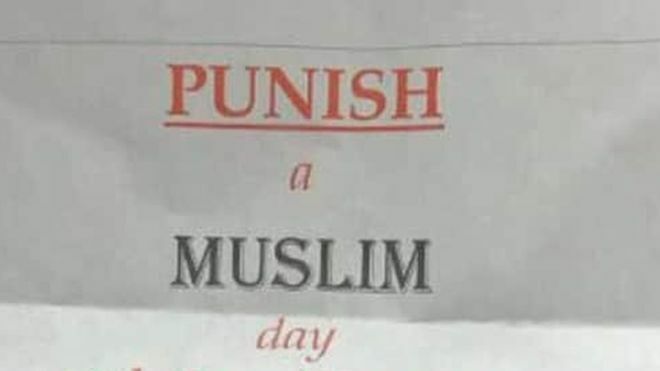 Ominous letters are being sent anonymously around the U.K. urging people to participate in a macabre game called “Punish a Muslim,” which awards points for doing things like burning down a mosque or throwing acid on a Muslim person. “Are you a ‘sheep’ like the vast majority of the population? Sheep follow orders and are easily led, they are allowing the white majority nations of Europe and North America to become overrun by those who would like nothing more than to do us harm and turn our democracies into Sharia-led police states,” the letter reads. “Only you can turn this thing around,” it continues. The letter then goes on to say that Punish a Muslim Day will be held on April 3 and participants can win points for a number of grotesque crimes. Verbally abusing a Muslim will win someone ten points while torturing a Muslim by electrocution or skinning wins participants 250 points. Ripping a headscarf off of a Muslim woman get 25 points. The highest prize, 2,500 points, is awarded for nuking Mecca. The letters sparked shock and fear in communities around the U.K. Naz Shah, a parliamentarian for Bradford West—one of the communities that received the letters—called on her constituents to report any suspicious behavior to the police immediately.